Blessington is situated in west Wicklow, twenty-five miles from Dublin. For almost a century and a half the town and surrounding area was associated with one of the country's premier landowning families, the Hills of Hillsborough, or the Downshires, as they are more commonly known. They acquired 17,000 acres of land centred on Blessington in the 1770s but the story of the estate begins a century earlier with the Protestant Archbishop of Dublin, Michael Boyle. The story of Blessington reflects that of the landed estate system in general. This was a system of landownership which had its origins in the late sixteenth and the seventeenth centuries when large tracts of land were granted to English and Scottish adventurers, soldiers and government officials in the plantations of that time. By the beginning of the eighteenth century the estate system was firmly in place. The landlords were a privileged minority, the élite of society by virtue of their wealth, education and titles. The 'big house' surrounded by a walled demesne, such as Russborough and Carton, and estate towns and villages, such as Hillsborough and Adare, are enduring reminders of the landed estate system. The landlords not alone controlled land tenure in the country, but dominated government and local administration as well as many aspects of the life of their tenants. It was a type of landownership that was not peculiar to Ireland but was to be found in one form or another throughout Europe. View of Blessington I857. Reproduced courtesy of PRON I D/67 I /M2/32. The landowning class was not a homogeneous group but consisted of different social layers. By far the largest were the owners of estates of less than 1,000 acres. These generally lived on their land and were the minor gentry in their locality. Above them were a smaller number, owning between 1,000 and 10,000 acres. At the top of the pyramid was a much smaller and more select group, who owned estates of 10,000 acres or more, some of which were in excess of 100,000 acres. These were the most wealthy and powerful people in the country and generally had estates both in Ireland and Britain. They included the Fitzwilliam and the Landsdowne families as well as the two families associated with Blessington, the Boyles and the Downshires. Munster Plantation which followed the Desmond Rebellion. With his knowledge of the law he worked for the government sorting out titles to land and in time acquired a large estate centred on Lismore, which is now owned by the Devonshire family. Archbishop Boyle was also successful in acquiring land. After the restoration of Charles II in 1660, he obtained not only his Blessington estate but also land in Cork, Dublin and Tipperary. He was not only a leading cleric, he also held secular positions including that of Lord Chancellor of Ireland. Shortly after acquiring his Wicklow estate, Archbishop Boyle obtained a charter from Charles II to build a new town, which he called Blessington. The town was built on a green field site and, like Hillsborough in County Down, it was given borough status, a corporation and the right to return two members to Parliament. At the core of the town he built a brick mansion which was enclosed by a walled demesne and deerpark, amounting to some 600 acres. A traveller to Blessington in 1709 gives this picture of the house and demesne. When Blessington House was completed, Boyle turned his attention to the building of St Mary's Church, the only extant building in the town associated with him. In September 1683, accompanied by the Bishop of Kildare and other clergy of the diocese, he joined the rector, John Sydall, members of the vestry committee and parishioners for the dedication of the church. A memorial in the chancel of St Mary's erected by Boyle's son Morough, Viscount Blessington, commemorates the founder. In addition to building the church for `the Glory of God, and the becoming celebration of Divine Worship', Boyle donated `flagons, chalices, and patens of silver' as well as the `six harmonious bells', which remain one of Blessington's most prized possessions. Archbishop Boyle died in 1702 and was buried in St Patrick's Cathedral in Dublin in the tomb of his cousin, the Earl of Cork. He was succeeded first by Morough, and then by Morough's son, Charles, who died without an heir in 1732. Morough's will had stipulated that the estate `continue in the family and blood of the late primate Boyle'. 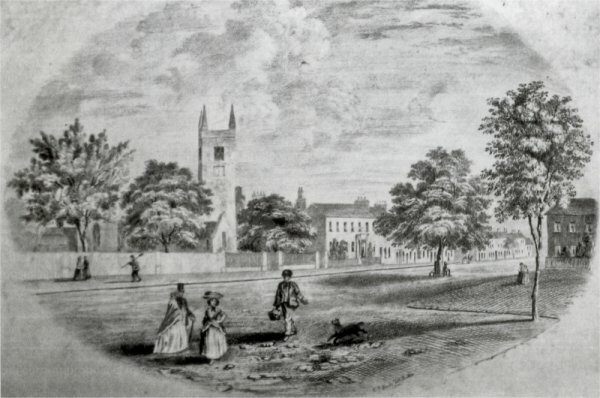 During the following forty years the estate passed to the families of Morough's daughters, Anne and Mary, until finally in 1778, it was inherited by Wills Hill, a great-grandson of Archbishop Boyle's daughter Eleanor who had married William Hill of Hillsborough.2 This began the Downshire association with the Blessington estate which continued until 1908 when the tenants bought out their holdings under the Wyndham Land Act. The estate stretched from the Kildare boundary to the uplands of the Wicklow mountains and encompassed 36 townlands, 31 of which are in county Wicklow and five in Kildare. When Wills Hill inherited the Blessington estate, the Downshire's were at the pinnacle of their power and influence. Like the Boyles, the family first came to Ireland at the end of the sixteenth century, when Moyses Hill, a landless young gentleman from Devon, fought in the Earl of Essex's campaign to subdue O'Donnell and O'Neill in Ulster. Following the break-up of the Gaelic order, opportunities arose for men like Hill to acquire land and in 1592 he obtained a lease on land in the vicinity of Lame. He later acquired 5,000 acres at Kilwarlin from Bryan Oge Magennis as well as land at Castlereagh previously belonging to Con O'Neill. He continued to add to his possessions, as did his son and grandson, Peter and Francis. The family motto Per Deum et Ferrum Obtinui — by God and the sword I obtained possession — is not an inapt description of how the Hills, with over 100,000 acres mainly in County Down, eventually became one of the largest landowning families in the country. Wills was more successful in his domestic affairs. He married Margaretta, sister of the first Duke of Leinster, and during his lifetime acquired many additional hereditary titles for his family including that of Marquis of Downshire in 1789. He was regarded as an improving landlord and promoted the linen industry in the north-east of the country. His most lasting legacy is to he found in Hillsborough town and castle. Under his direction, the town as we know it today — the castle, church, market house, town square and revamped fort — is largely due to him. He was also associated with the rebuilding of Downpatrick Cathedral. When Wills Hill acquired the Blessington estate, he set about refurbishing Boyle's original mansion under the architect, Charles Lilly, who had also worked on Hillsborough Castle and Downpatrick Cathedral. As in the case of Hillsborough, Wills also redesigned Blessington, creating the square, widening the main street, building an inn as well as encouraging prominent people such as Lilly and his Blessington agent, William Patrickson, to build houses. He resurrected the town corporation and commissioned a ceremonial mace, now held in the Ulster Museum. He also commissioned a mace for Hillsborough at the same time. However, all was not well with the Hill family and by this time they were hard up for cash. Early in 1785, Wills sent a request from Dublin to the family accountant in the north asking that 80 guineas be paid into his bank account as a matter of urgency, `otherwise', he said `I shall not leave Dublin without danger'. Five years later, his son, Arthur, spent £30,000 on an election campaign to defend, unsuccessfully as it turned out, a challenge from Robert Stewart, the future Viscount Castlereagh, to a seat in Parliament. As a result Arthur claimed he had to live a most uncomfortable life for six or eight months. For the servants in Hillsborough the financial straits of the family were critical; in December 1798, they had not been paid for three years and were said to be starving. Arthur, second Marquis of Downshire, inherited in 1793. His wife, Mary Sandys, was said to be the greatest heiress of the day, with estates in Dundrum, County Down and Edenderry, County Offaly as well as a mansion and estate in Easthamstead, Berkshire. Even all this wealth was not sufficient to solve the Hill family's financial problems. Arthur lived mostly in London but kept abreast of what was happening in Ireland. From November 1796 onwards letters to him increasingly were concerned with the United Irishmen and the threat of rebellion. In early May 1798, raids for arms were made on Blessington House and farms in the area. When the rebellion eventually broke out three weeks later, the rebels in County Kildare were forced to retreat from Naas and Ballymore Eustace to Blackamore Hill close to Blessington, where they set up camp. From there they raided the town and burnt the mansion. A letter written by the local parish priest, Rev Roger Miley, to Dr Troy, the Catholic Archbishop of Dublin, described what happened. The raids on Blessington continued into September but by then many of the tenants had left the estate. The town was now in ruins and the surrounding countryside devastated. When life gradually returned to normal, people began assessing the damage to their property and many submissions were made to the commission established by the Government to consider the claims of those who had suffered losses during the rebellion. The Marquis of Downshire received over £9,000 for the destruction to his property but he never rebuilt the mansion. Arthur Hill died at an early age in 1801. His eldest son was only 13 years old and so his mother, Mary Sandys, looked after the estate until he came of age in 1809. Two years later he married Maria, daughter of the Earl of Plymouth. However, behind the splendour of his inheritance, titles, estates and great houses, lay a sombre reality; the third marquis had also inherited an enormous debt of £300,000. He was hard-working and conscientious and tried all his life to reduce the debt. First he cut his personal expenses. He let his house at Hanover Square in London and when visiting that city lived in lodgings thus saving £1,000 per annum. He was often short of ready cash and on one occasion was obliged to ask his mother for a loan of £300. He was convinced of the need to run his estates more efficiently. During his minority, Thomas Handley had been appointed legal adviser and auditor for all the Downshire estates in England and Ireland, but it became apparent that Handley, who was based in England, was too far away to oversee the detailed running of the Irish estates. Thus a central office run by an accountant and various other officials including a chief agent was established at Hillsborough. From then on all the local agents in Ireland would answer to the Hillsborough administration. The third marquis kept himself informed of everything that was happening on his estates and was party to all the decisions made. It is because of this that a large body of documentation, including a continuous flow of letters from the Blessington agent to the Hillsborough administration, is now available in the Public Record Office of Northern Ireland. Consequently we know a great deal about the running of the Blessington estate in the first half of the nineteenth century. The third marquis was considered an improving landlord and throughout his lifetime promoted good agricultural practice on the Blessington estate. The tenants were encouraged to sow turnips, vetches and a mixture of different grasses, to plant potatoes in drills and to spread lime on their land. Improved breeding stock was made available and the establishment of a farming society encouraged good farming habits. Competitions were held and prizes given to the farmer who could plough best and keep hedgerows and holdings in good order. Competitions for women encouraged them to knit, weave and breed fowl. The marquis initiated a forestry scheme at Ballynabroky, one of the upland townlands of the estate, which was planted with oaks, Scots firs and poplars. The scheme was started in 1831 and called Coronation Plantation in honour of William IV who had become king in the previous year. A monument, which is still on the site, proclaims that the project was `for the future supply of useful timber for the estate and improvement of the county and the benefit of the labouring classes'. We are told that at one stage over 20,000 acorns were sent to Blessington for planting. The Downshires did not benefit much from the scheme but it provided a useful supply of fuel to the people in the area during the First and Second World Wars. 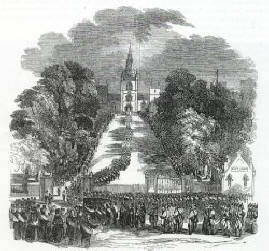 Funeral of the 3rd Marquis of Downshire at Hillsborough Parish Church. In 1868, the fourth marquis died suddenly at the age of fifty-six. His son, the fifth marquis visited Blessington with his wife, Georgiana Balfour of Balbirnie, Fife, in October 1870, when a fireworks display took place and porter was distributed to the tenants. But his reign was brief; he died in 1874 aged twenty-nine. A long minority ensued, during which the estate was managed by three trustees, Lord Bridport, Colonel Bateson and Lord Arthur Hill, the younger brother of the fifth marquis. During the period of the trusteeship, the Land War broke out and tenants throughout the country were united in defying their landlords. With newly found confidence, the tenants demanded that the rents be lowered and they withheld payment if this was not granted. Using the powerful new weapon of boycotting, they ostracised the landlords and agents and any tenant who broke ranks. This forced the Government to pass a series of land acts, which eventually enabled the tenants to buy out their holdings and become the owners of their land. It also proved to be the death knell of the landed estate system. On the Downshire estates, the question now was not whether but when the landlord would sell to the tenants. This happened on the Blessington estate under the sixth marquis, who had inherited in 1892, and the sale was completed by 1908. In reality, the connection between the Downshires and Blessington had virtually ceased four decades earlier with the death of the fourth marquis. The Downshire link with the northern estates was maintained for a while longer. Lord Arthur Hill, MP for County Down for nearly thirty years, stayed regularly at Hillsborough Castle in the last quarter of the nineteenth century, and his nephew, the sixth marquis, when visiting the north stayed at Murlough House in Dundrum. Hillsborough Castle was sold in 1922 and subsequently became the official residence of the Governor of Northern Ireland and later that of the Secretary of State, a situation which pertains today. The Downshires, in the words of their family motto, may have come with the help of God and the sword but they left without a whimper and so the once great dynasties of the Boyles and the Hills, which for so long had dominated the lives of the people of Blessington, quietly came to an end. 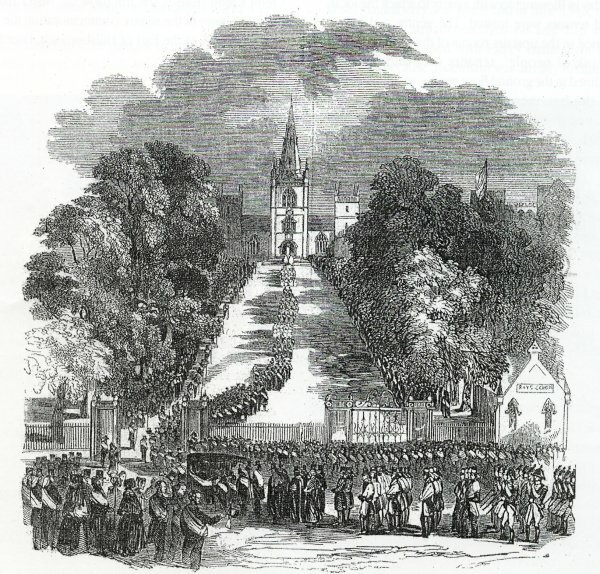 Today, the principal reminders of their reign in Blessington are St Mary's Church, the agent's house (until recently, the Downshire Hotel), the Market House (now Credit Union House), the Inn (now the Ulster Bank) and the monument in the square commemorating the coming of age in 1865 of the Earl of Hillsborough, later the fifth Marquis of Downshire. 1 Trinity College Dublin, MS 888/2 f.162. 2 2 He was a grandson of Moyses Hill. the founder of the Hill dynasty and in June 1690 entertained William of Orange who was passing through Hillsborough on his way to the Battle of the Boyne. 3 3 W.A Maguire, `Owners and Occupants'. in Hillsborough Castle (Belfast, 1993), p.13. L. Stephen and S. Lee (eds), Dictionary of National Biography (Oxford, 1917), vol. IX, p. 879. 4 4 Rev Roger Miley to Archbishop Troy, Blessington, 4 June 1798. Dublin Diocesan Archives, Troy Papers AB 2/I 16/7. 5 5 Public Record Office of Northern Ireland, D/67I/C/214/164. 6 6 Public Record Office of Northern Ireland, D/67 1/C/214/15, 17, 96, 97. 7 7 Belfast Protestant Journal, 19 April 1845 and Belfast Newsletter, 25 April 1845. 8 8 P. Pelly and A. Tod (eds), The Highland Lady in Ireland: Elizabeth Grant of Rothiemurcus (Edinburgh, 1991). pp. 45161.